Speaking over the phone this past September, Pressley explained that when she was on Boston’s city council before her history-making run for Congress, she wore her hair in all manner of styles, including extensions, flat ironed, and occasionally rocking wigs. “I’ve done everything,” she said. 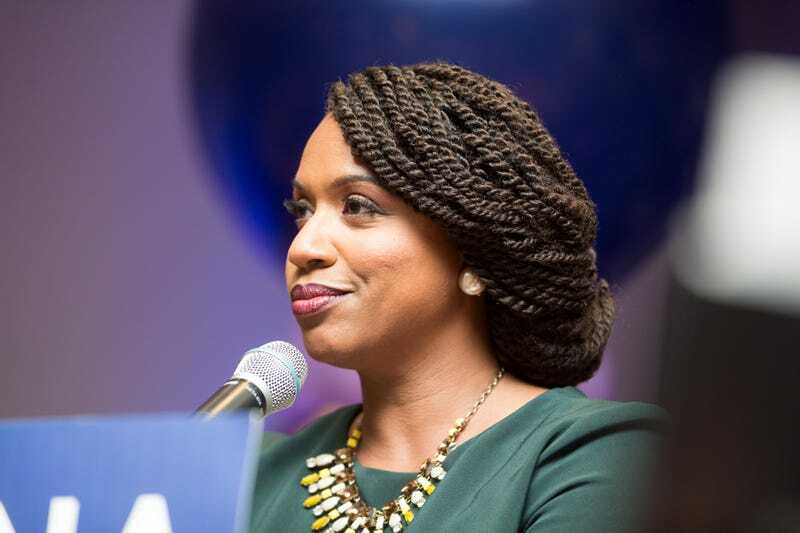 According to Pressley, this has resonated with a number of black women across the country who tell her they’ve never seen a politician on her level—in the national spotlight, and looked at as the future of the party—with their hair in braids. Historically, no matter how progressive a woman’s politics are, working as a public servant means adhering to very conservative dress and styling. (Just last year, Congress took some heat for its ban on sleeveless dresses.) For black women politicians in particular, this heightened attention to appearance means limited choices—and outsized scrutiny—when it comes to how they wear their hair. Ingrid Banks, associate professor of Black Studies at the University of California Santa Barbara and author of the book Hair Matters: Beauty, Power, and Black Women’s Consciousness, recalled how two prominent black psychologists—both male—analyzed black women’s reasons for straightening their hair. Even when those choices pivoted on white standards of beauty, she said, there was an undeniable component of personal dignity. “You know you don’t walk out of a house with your hair undone, unkempt. They talked about it within the context of racial pride, but not within this black nationalist rhetoric,” Banks said. She also pointed out the gendered focus on racial pride, and how black women have disproportionately been held under a microscope for their grooming choices. “What’s interesting is that all these ideas about race and racial pride were being played out on black women’s bodies,” she said. When I shared this with Banks, she didn’t find it surprising, chalking it up to respectability politics—the phenomenon of a marginalized group policing each other to show their values are, if not entirely in step with the mainstream, at least compatible with it. Respectability politics don’t challenge the status quo, but posit that the marginalized group—in this case, black people—are very much a part of it. As Banks points out, this policing transcends class, age, and gender. And far from acting from a place of shame, the women around Pressley likely voiced concerns because they knew how high the stakes were for a candidate like her—and that “ethnic” styles like twists and braids are frequently seen as unprofessional, or, worse, threatening. Pressley herself was certainly aware of the stakes, mentioning that when you google “unprofessional hairstyles,” a flurry of images of black women crop up: row after row of type 3 and type 4 curl patterns—and the occasional set of braids—rolling across your screen. The problem with how natural hair is perceived is obviously felt in a number of industries, with some black women professionals feeling the brunt of this hair bias more than others. And it’s important to note that black women’s hair has been policed and legislated by any number of American institutions, from elite schools to the military, which just lifted its ban on dreadlocks (and twists) last year. Banks pointed out that the stakes are particularly high for black women in jobs that emphasize “front office appeal” (or FOA), which place tremendous weight on a person being able to cultivate trust and comfort to a broad, “mainstream” (read: white) audience, pretty much on sight. For all candidates, this has traditionally meant cultivating a look that hits an array of pleasing—but not forced—notes. Hard-working and capable, but not pretentious; well-groomed, but not prissy; clean cut and “all-American,” but not afraid to get dirty. It’s quite a needle to thread, and for black women, there’s even less room for error. “These mainstream, you know, white bread companies, they want to present an image of black women that is comforting,” Banks said. In politics, FOA is part of what gets a candidate on the ballot and into office, which in part explains why, out of the 39 black women who have been elected to the U.S. House of Representatives, only four—Reps. Barbara Lee, Gwen Moore, Marcia Fudge, and Karen Bass—have worn their hair in what seems to be natural or “ethnic” styles. “There’s a way in which ‘natural’ styles are seen as presenting this authentic blackness, right? And the authentic blackness then is seen as a threat, is seen as troubling to white America. And so the straightened style becomes a way of presenting this accommodationist, if not integrationist image for black women,” Banks explained. This is one of many reasons why a small but powerful group of black female candidates in 2018—including Georgia gubernatorial candidate Stacey Abrams, Illinois Congresswoman-elect Lauren Underwood, and Pressley—are so remarkable, and why something as simple as they way they wear their hair has been so resonant among black women and girls. “We can win the highest office in Georgia without changing my hair, my gender, my race or my beliefs,” Abrams said during her history-making campaigning in October. Pressley talked about one constituent who came up to her and told her she, too, had decided to get Senegalese twists. “She calls them her ‘Ayanna braids.’ She has never seen someone in a high profile position wearing her hair that way and it inspired her and emboldened her,” she said. Such exchanges happen often. At Mother Caroline Academy in Dorchester, Mass., a private, tuition-free girls’ school where black girls comprise the majority of the student body, students warmed to Pressley, remarking that her hair was “just like theirs,” she said. Pressley herself has embraced this connection, telling me about a young woman on Twitter who wrote that she recently scored an interview for a job in politics—a field she had been trying to get into for a long time—but had gotten box braids the day before and was worried how she might present. The user added the only women she’d ever seen in politics wearing her hair in braids was Pressley. “So I wrote back on this thread and I said, you know you can rock your black girl magic in box braids and in twists, in locks and and extensions, in an afro,” she said. “The professionalism is all in how you carry yourself.” She then tagged in Abrams, and the new black women who had been elected to the Boston City Council—“all of whom wear their hair naturally, in locks and otherwise,” she said. Plus, Pressley has been getting the itch to switch up her style again—something she’s always done. Beyond that, there’s this unavoidable fact: The look is very much a part of her brand now, so much so that she’s been told that if she changes it, voters wouldn’t recognize her. “I sort of needed to have some brand continuity, if you will,” she said. Considering Pressley’s authentic self, as she described it, is someone who embraces change—particularly when it comes to her hair—it feels more than a touch unfair that she may be locked into a hairstyle precisely because it is so recognizable and specific to her, regardless of whether she herself is ready to move past it. In pushing one envelope, you hope she doesn’t inadvertently get trapped in another one—this idea that women, politically and sartorially, ought not to be more than one thing. Because what woman doesn’t know the thrill of peeking into the mirror after long hours spent in a hairdresser or stylist’s chair, weary from the weight of strange hands pulling through her hair from scalp to end, to finally feel that shudder of excitement when she encounters, once again, her reflection? To see herself there: new and familiar at the exact same time? To see that image reflected, again, from the nation’s highest political stages—where such faces are still few and far between—becomes an act of affirmation. And no matter how Pressley wears her hair once she’s sworn in in January 2019, that recognition—the recognition of her beauty, her power, but more importantly, an affirmation of the choices available to black women who want to shape the world in which they live—and remain their authentic selves in the process—will stand. Obamaganza: Michelle Obama Continues Her Reign on Essence&apos;s Next Cover—in Curls!